We are always on the hunt for great new recipes that make dinner time easy for our busy family. Dinner time is one of the most important times you can spend with your family. But it is not always easy to make the time for it on those busy weeknights! 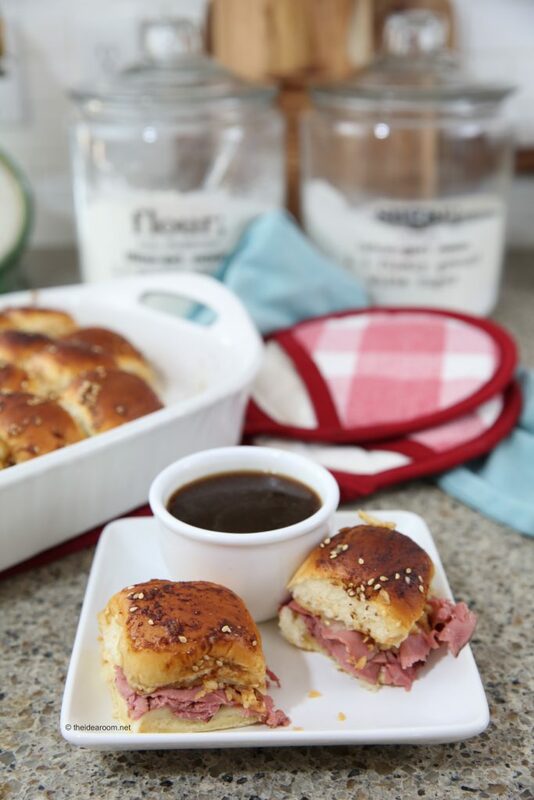 When my sister shared with us this French Dip Sliders Recipe at a recent family get together, I knew we had another easy dinner recipe to add to our rotation. This recipe was originally found over at Chelsea’s Messy Apron. We made a few very slight alterations to fit our family. The kids all LOVED this and that is sometimes difficult in a large family with different eating preferences. The recipe also takes just a few minutes to prepare, so it takes about 30 minutes before dinner is ready to serve and on busy weeknights, fast prep meals can be a lifesaver. This is so easy to make, you can have the kids make it for you while you take care of other responsibilities! Spray the bottom of a 9 x 13 baking dish. Do not separate the rolls into individual rolls. Take the entire block of 12 rolls and slice through the rolls creating a top section and a bottom section. 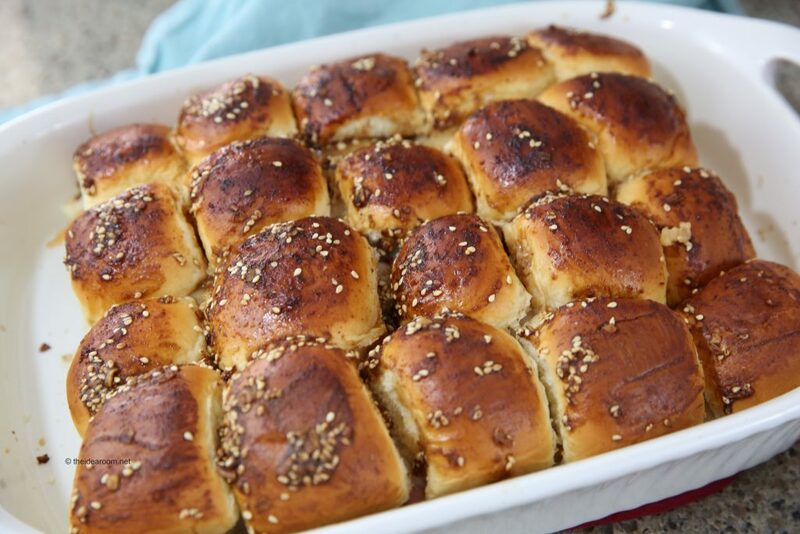 Place the bottom half of the rolls in the baking dish. 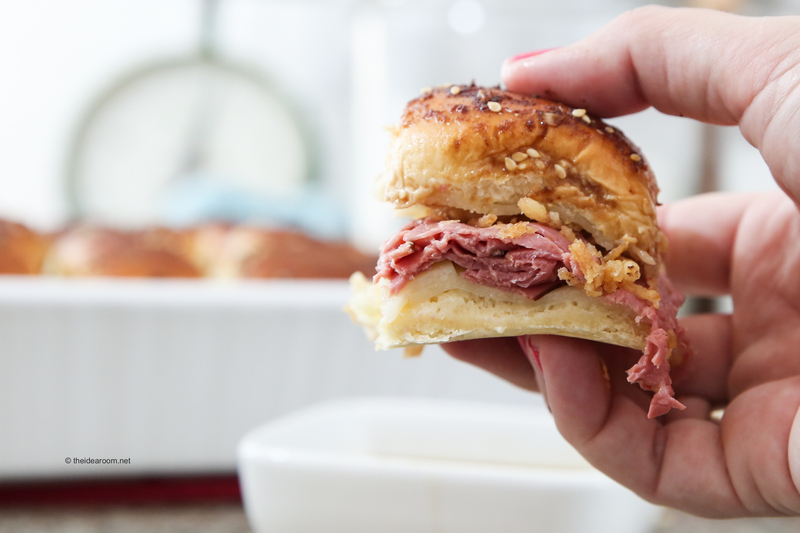 Top with 6 slices of the provolone cheese, roast beef, french fried onions, remaining 6 slices of cheese, and the other half of the rolls, in that order. Mix in 1 tablespoon of the au jus seasoning mix, Worcestershire sauce, sesame seeds, dried minced garlic, onion powder, and whisk until well combined. Top the rolls evenly with this mixture. Top until well coated. You may have some leftover that you can set aside and use to dip the sandwiches in while eating if you want. Bake uncovered for 12- 15 minutes until the cheese is melted and the tops of the rolls are golden brown. 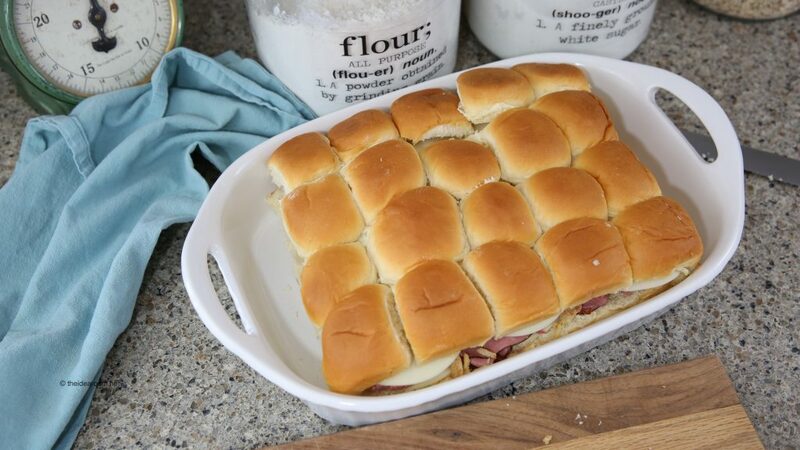 Remove and cut the sliders into 12 separate slider sandwiches and serve immediately. *Slightly adapted from Chelsea’s Messy Apron. 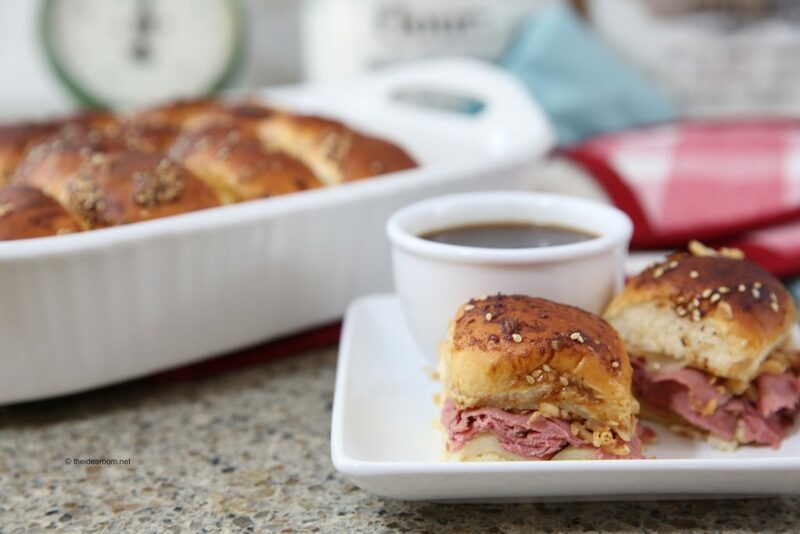 We use the rest of the Au Jus Dipping Sauce packet, we whip up some French Dip Sandwich Dipping Sauce that the kids can use to dip their French Dip Sandwiches in. I personally and not a big fan of the dipping sauce, but I have a couple of kids who are big dunkers, and they are happy to take my portion. Go ahead and give them a try! I think you will like them too. Feel free to swap out the meat or the cheese if you prefer a different one. Am I missing something? How do you use the 2 tablespoons of butter listed under Sliders? Heather- The butter is used to coat the bottom of the pan before placing the sliders. You can also just spray the pan with non-stick cooking spray if you prefer. Sorry so confusing. Thanks. Perfect for Sunday dinner after church! These are perfect! 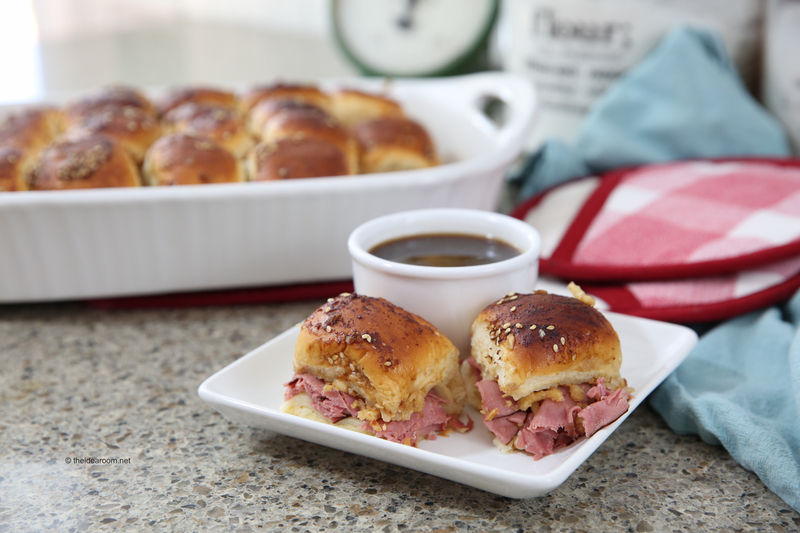 Sometimes, those bigger French dip sliders can be too huge! These are the right size & look fabulous!